Capri Big Block Ford Hotrod! 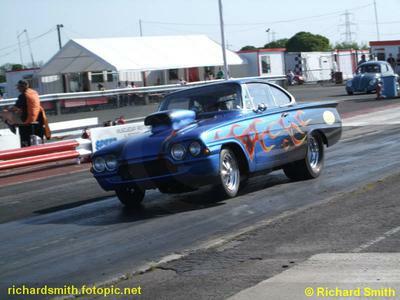 Capri big block ford hotrod - Seen here is my old hotrod which after more than 30 years of ownership I had to let go (divorce). 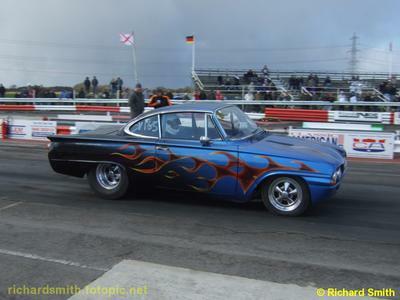 It's a 1962 ford consul Capri, big block ford 460 ci 9 inch rear end, full chassis. What can I say about my "Old Flame"? Lets go back to 1975. 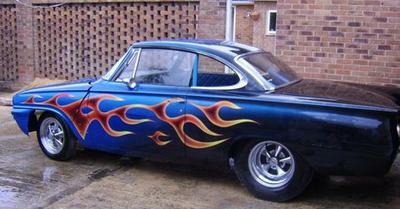 2 good buddies go to see an old ford consul Capri which was underneath a tarpaulin, hand painted silver. Yuk! The elderly guy who owned it told us, "Yes it's for sale, but without the engine", which didn't matter to us. We had visions of a small block and chrome jag rear end? £150 and we took the car off to its new home, a lock up garage. In fact at one stage my buddy was living in the car for several months. Hard times for him. We discovered some history about the Capri. Turned out to be totally immaculate low mileage (600 miles). My buddy sold the car to me so he could raise the deposit on an apartment. 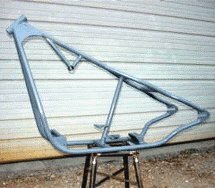 My vision was an old style high riding gasser look, which I did, but then changed my mind when when the pro street look came into vogue, so being young and foolish, I cut out the complete floor pan and built a steel box section chassis with full 10 point roll cage. So in went a big block ford (460 ci) with C6 auto box, a 9 inch axle, and strut front end. I wanted to use this more for the street rather than Drag Racing, so made the bulkhead, dash and floor pan from sheet steel. All bead rolled front to back. I rebuilt the engine and auto box and kept it fairly mild. May be 400 hp? The first time I raced it it ran an easy mid 12 sec quarter mile, and to think it only took me about £20000 and 21 years to achieve this?